Integrating a robot to accomplish robotic label placement in the plastics and container industry is not a typical application. For some years, as many as 66% of all robots installed were used in automotive facilities. 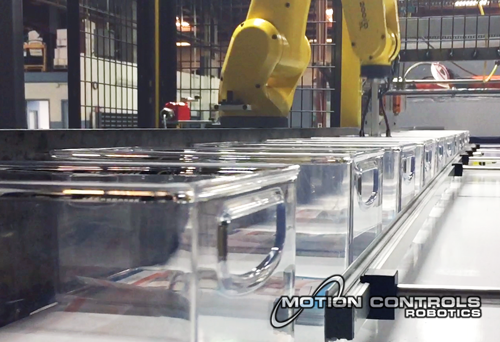 The installed robots accomplished material handling tasks requiring precision and heavy lifting. According to the International Federation of Robotics, today the automotive industry makes up only 38% of total robot sales. This diversifying trend in robotics shows in our latest robotic label placement integration cell. This cell is a great example of using innovation and technology to improve a process that might not be as common for robotics systems. This robot system quickly and accurately places a product label inside different sized containers as they travel down a conveyor for final stacking and case packing. This customer handles a variety of sizes and innovatively shaped storage containers for household organizational purposes. The company was looking to integrate a robot system that could handle placing a product sheet label in at least 5 different, smaller container models. The customer came to us with the hope of being able to improve throughput and consistency in their label placement process. First, the conveyor and label fixture are setup to handle the container size that will be running through the system. Then, the conveyor moves the finished molded plastic bins through the process. Each container goes through a glue station which adds a drop of glue that will hold the label in place. The containers enter the robot cell from an infeed conveyor. At this point, a FANUC LR Mate places the label in the container. Finally, the labeled container continues for case packing. The video below shows the robotic system in action. An LR Mate 200iD 7L was integrated into this robot system. The label weight in the project did not come into play as much as the rate and reach the robot needed. The end of arm tooling used two suction cups to pick the different sized label from the attached fixture. 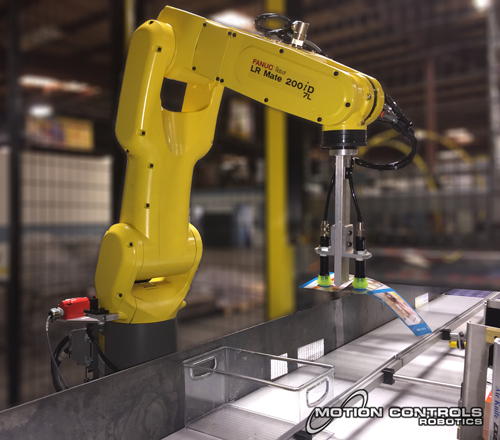 Motion Controls Robotics follows the RIA 15.06-2012 Safety Standard designed to make sure employees and robots work safely together. We take full advantage of new technologies and innovations available. Each system is complete with safety fencing and cell entry gates equipped with safety interlock switches. “Dog house” guards prevent operators from reaching into the robot area. The user-friendly cell allows the operators to easily switch between container size using the HMI. The HMI display shows error states and monitors the cell entry. As a result, the robotic label placement process consistently places 28 labels in one minute. The consistent, predictable rate, most of all, keeps the company from experiencing bottle-necks in their operation. The company is happy with their first robotic system, and they hope to add more label placement cells for other container models. This system is a great example of how robots are being used to benefit a variety of applications. These applications can range from simple, basically serving the purpose of consistency, to complex with multiple purposes and steps.